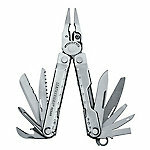 On Scene: New Leatherman Tools, one for every budget! 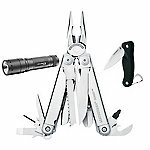 New Leatherman Tools, one for every budget! New hand tools appeal to the everyday Firefighter because one tool can be packed with many functions--making them both convenient and practical. 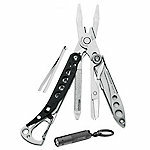 Leatherman never fails to come up with some great multi-tools, and below are some of the newest and greatest offered, check them out. The Leatherman Surge is one of Leatherman's two largest multi-tools; a real powerhouse, built with their largest pliers, longest multi-tool blades and easy-to-use locks. A unique blade exchanger, large and small bit drivers and four outside-opening blades give you quick access to the tools you use most. The Surge was built for tough jobs and the hands that do them. 21 tools in one, 2 bit count. With the new Rebar, fans will immediately recognize the iconic box-like body and sloped-neck design found in the Super Tool® 300 and Micra®. This new soon-to-be favorite rounds out Leatherman's classic "heritage" line of products by offering one in each size category. Just like the Super Tool 300, the Rebar pliers have been optimized for strength and feature replaceable wire/hard-wire cutters - a first for a four-inch tool from Leatherman. With all the features to get even the toughest jobs done, in a smaller, slimmer size, the new Rebar is sure to be an instant hit on job sites, and home-projects the world over. 17 Tools in one--visit the direct link for more details. The handy Style CS is one unique clip-on multi-tool. With spring-action scissors, a file, knife, tweezers, bottle opener and mini-screwdriver, you'll never be without your most necessary tools. Fits in a pocket or clips on your pack or bag for easy portability. So stylish it's almost a shame it fits so easily in your pocket. 6 tools in one, see the website for more detailed specs. The handy Style PS is one unique, travel-friendly, multi-tool. With spring-action pliers, a file, scissors, tweezers, bottle opener and mini-screwdriver, you'll never be without your most necessary tools; now even when you travel! Fits in a pocket or clips on your pack or bag for easy portability. So stylish it's almost a shame it fits so easily in your pocket. Follow this link for more details. Whichever multi-tool you choose, you're sure to love it!